STOP A BULLY is a registered national charity and Canada-wide anti-bullying program developed in 2009 by a B.C. teacher which allows any student who is a victim or witness of bullying and cyberbullying to be able to safely report the details to school officials. Any student, at any school in Canada, can use this reporting service which is provided at no cost to all students and schools. The Stop A Bully program helps increase bullying awareness and accountability within schools to allow officials to be more proactive in preventing serious incidents of bullying. 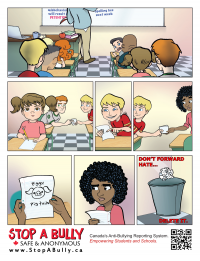 Stop A Bully provides schools with critical information to be proactive in assisting all students who are witness, target and perpetrator of school bullying. The comic you see on the left was conceived by president of Stop A Bully Trevor Knowlton and illustrated by me. It was my first real attempt at anti-bullying comics of hopefully many. I like the purpose of Stop A Bully. It is an effective line of communication getting the message to the people responsible for the safe and caring environment of the school hallways and classrooms. They also have a Pink Wrist Campaign to raise awareness of bullying and giving students the help they need to speak out. If you are interested, you may find an Overview of Stop A Bully helpful.